Does your dog shiver when it goes outside? Does your kitty get cold when it goes out to hunt during the winter months? Here are some smart tips to keep your four-legged friends warm and comfortable. One of the best things you can do for pets is to keep their natural coats intact during cold weather. This means no trimming, clipping, or shaving your dogs or cats. The reason for this is simple: a pet’s natural coat is designed to protect them from the elements, and trimming off things like guard hairs or dense insulation can leave pets cold. For some dogs, this is enough to keep them warm during the winter. Other animals might need some additional insulation in the form of a jacket when they go outside. Provide Shelter. Outdoor pets need shelter to keep them out of the wind, snow, and rain. While this shelter can come in many different shapes and sizes, the essential aspects are that the shelter has a roof and at least three walls to keep the elements out. The shelter should also include some insulation, in the form of straw, blankets, or hay. Offer Ample Food and Water. Digestion keeps pets warm. With this in mind, be sure to offer plenty of food and water. Since water freezes during the cold weather, consider adding a heater to keep it warm and ice-free. Check food often to ensure your outdoor pet always has enough. Bring Pets in During Extremely Cold Weather. If the weather gets frigid, bring your pets in. Pets can quickly freeze to death or suffer frostbite during chilly weather, so it’s essential to protect them when the weather dips. If you’re shopping for pet shelters, remember that you can buy heated shelters, water bowls, and other items online. Just pick one that is large enough to provide ample space for your pets and will stand up to the severity of your environment. If you have outdoor pets, or indoor animals that spend time outside, be sure to bundle them up when they venture out. 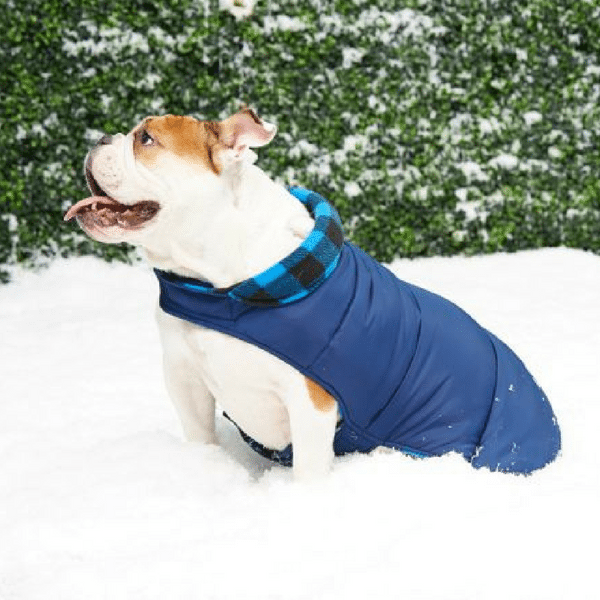 Today, there are dozens of different types of coats and insulative layers available for pets. Choose one that fits your animal (shop online or go to your local pet shop to shop options), and then put it on every time they go outside. If you see the dog shivering or getting cold, consider going inside or adding an extra layer for warmth. You might also want to pay particular attention to the animal’s paws, which can quickly get frostbitten or chapped from icy sidewalks and ample amounts of ice melt. With this in mind, put booties on dogs to protect their paws, and inspect paw pads frequently for signs of frostbite or chapping. If you have animals that live outdoors at all times, like horses, goats, or sheep, be sure that their coats are long enough to protect them from the cold, or that they’re wearing blankets or coats to shield them from the moisture and the wind. On this same note, be sure to check under the blanket to ensure the animal isn’t sweating, shivering, or rubbing their shoulders raw. The winter comes with a whole host of toxic items that can be dangerous to pets. With this in mind, keep poisonous items like antifreeze, coolant, and ice melt away from pets. While many pets will keep away from these substances, some will ingest them because they taste unusually sweet or salty. As such, you’ll want to keep these in a locked cupboard where pets can’t access them. If you’re curious what toxic substances to keep away from your pets, check out the Humane Society’s list of common poisons and other dangerous substances. If you have an older or a very young pet, provide some extra traction when you go outside. Simple things, like adding sand or salt to your sidewalk, or putting down rubber mats can prevent falls that result in strains or broken bones. Even if you don’t use these items all the time, consider adding them when the conditions are very icy or when you’re taking your pet out for a walk. While this may seem like a small tip, it’s essential to keep pets (and people) safe during the chilly winter months. If you’re wondering how to keep your pets warm, the good news is that there are many simple places to start. While the exact approach you take will depend on whether you have indoor or outdoor animals, and what type of pets you keep, it’s still essential to pay close attention to them and ensure, at all times, that they’re well-equipped for the rigors of the outdoor world. As the winter progresses, be sure to check in frequently on your pet. If you notice that your animal is cold or seems to need additional assistance to stay warm, be sure to provide it. Pets need simple things, like food, water, and shelter in ample amounts during the winter. If you need more help figuring out how to care for your pets during the winter, don’t hesitate to contact your local veterinary office or the humane society in your area. If you’re moving this winter, Move it Cube it can also help you take the steps you need to get into your new home.